Recently, Google announced that they had brought their popular Reminders (to-dos to us normal people) feature to the Google desktop calendar. This was great news for most people, (including me) but there was a slight hitch. 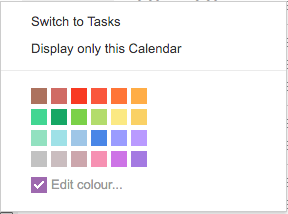 Under the current implementation you can only view either Reminders or Tasks and as a result quite a few people have been reporting ‘lost tasks’. 1. Select the drop down arrow next to the Reminders calendar. 2. In the pop up option menu you will be given the option to “Switch to Tasks”. 3. Click on the link and you will see all your Tasks again. See? Told you it was simple! If you’d like to know more about Reminders, Tasks or anything to do with Google and productivity why not let me know in the comments?